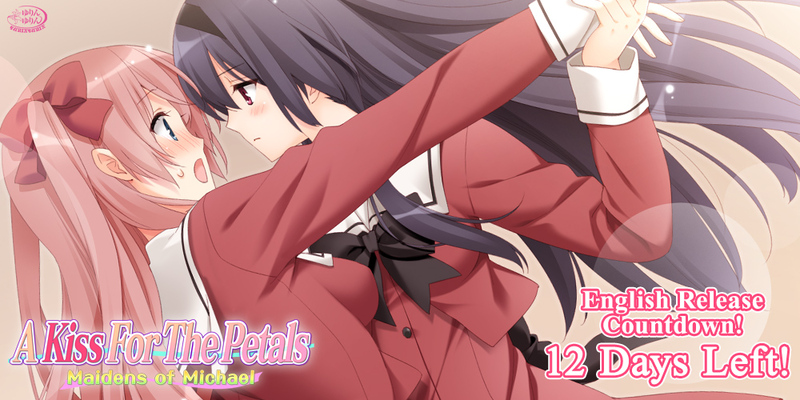 A Kiss For the Petals: Maidens of Michael Countdown – 12 Days Left! The release of A Kiss For the Petals: Maidens of Michael is almost here! We hope you are as excited as we are! As a special treat, we’ll be counting down each day until release and showcasing each couple with their very own brief voice dramas! Risa: Miya-san, you skipped class again, didn’t you? Miya: Could you please be quiet? I’m trying to eat right now. Risa: S-Sorry… But can you at least listen to what I have to say? Miya: Risa-san, when I am having lunch, I must be free from the distractions of others… How should I put it? It must be a reprieve. Alone, quiet, and fulfilling. Miya: “A Kiss For The Petals – Maidens of Michael” goes on sale twelve days from now, Miss Class Representative. * This is in reference to a Japanese manga and television series, Solitary Gourmet (孤独のグルメ Kodoku no Gurume). A Kiss For the Petals: Maidens of Michael is now available for pre-order! On sale February 22nd on MangaGamer.com and Steam! Tagged maidens of michael, sonohana, yuri.